2. 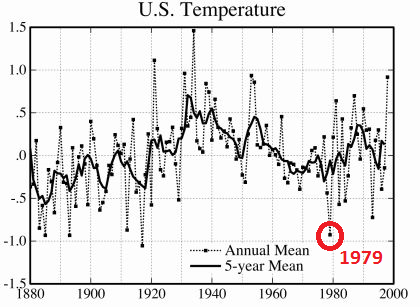 The “pause” began around 1993. The measured warming is all in the first 14 years (1979-1993). Their graph (with corrections to compensate for both ENSO and volcanic forcings) shows no noticeable warming since then (1994-2013). Christy & McNider (2017) (or preprint) did a similar exercise, and found a similar rate of warming (0.096°C/decade), and calculated a tropospheric TCR climate sensitivity of +1.10 ±0.26 °C per CO2 doubling, about half the average IPCC AR5 estimate. The paper is quite long, but here's a readable discussion. The fact that when volcanic aerosols & ENSO are accounted for the models run hot by about a factor of two is evidence that the IPCC's estimates of climate sensitivity are high by about a factor of two, which suggests that a substantial part, perhaps half, of the global warming since the mid-1800s, was natural, rather than anthropogenic. That's consistent with a TCR sensitivity of under 1.0°C, and an ECS sensitivity of perhaps 1.5°C, which most scientists would agree is not enough to worry about. 1. My climate sensitivity calculations. 3. A copy of this article suitable for pasting to blogs, here.